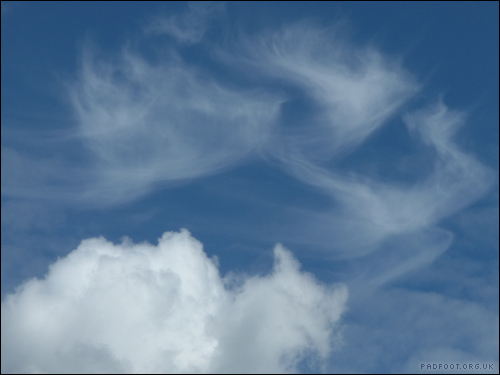 There were some unusual cloud formations today, but these wispy clouds caught my eye – they were just so different to the usual fluffy clouds. This entry was posted in Dragon Goes Wild and tagged #StayWild, 365 days wild, Cloudscape on July 31, 2016 by Dragon. 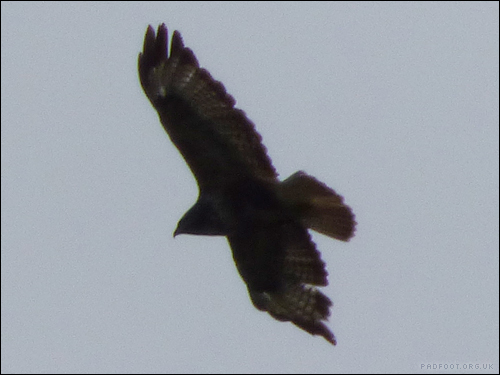 The screeching call of the local Buzzard prompted me to get out for a walk around the block. 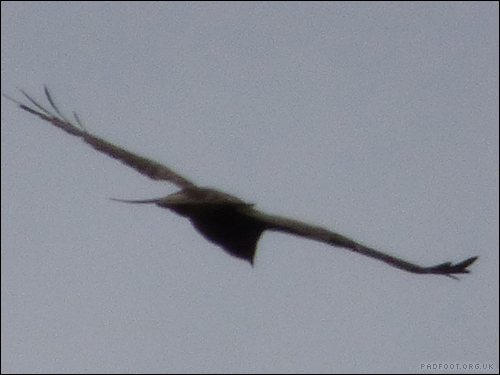 I hadn’t gone far before I spotted a load of crows all circling nearby. Wondering if something had spooked them, or if they were just flocking around a source of food, I took a few steps further and was treated to the Buzzard flying quite low overhead! It went on to circle quite high, but with the cloud cover it was still quite easy to spot. 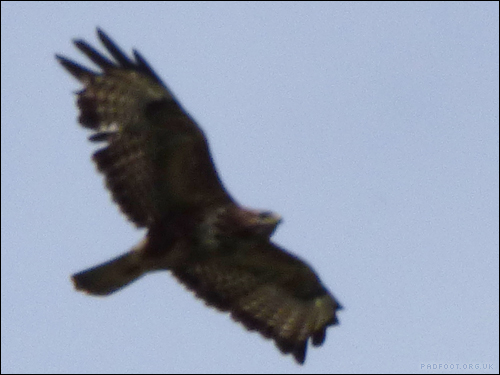 This entry was posted in Dragon Goes Wild and tagged #StayWild, 365 days wild, Buzzard on July 30, 2016 by Dragon. This particular blackbird has been a regular visitor to the garden – she’s not after the berries in the Berberis (I think all the berries have been eaten already! 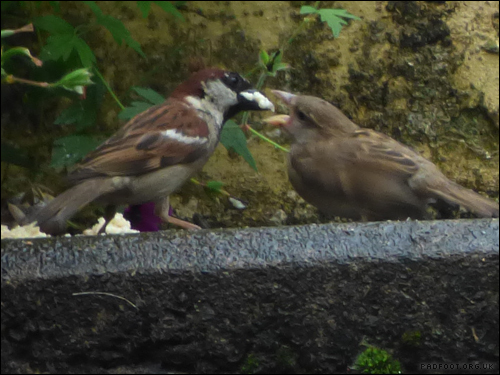 ), but comes to gather up some food we’ve put out, then take it away for her youngsters to share. It’s certainly keeping us busy, making sure there’s enough food for the sparrows, young robin and blackbirds to share! 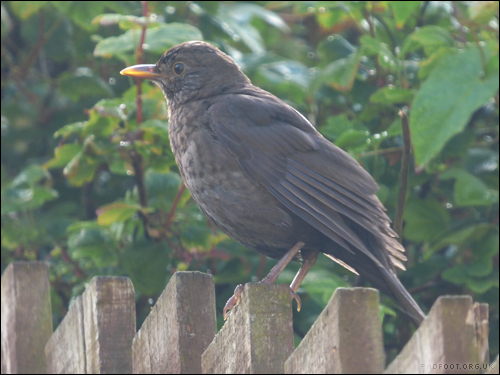 This entry was posted in Dragon Goes Wild and tagged #StayWild, 365 days wild, Blackbird on July 29, 2016 by Dragon. The weather’s been a mixed bag today – blue skies and sunshine one minute, and rain the next! 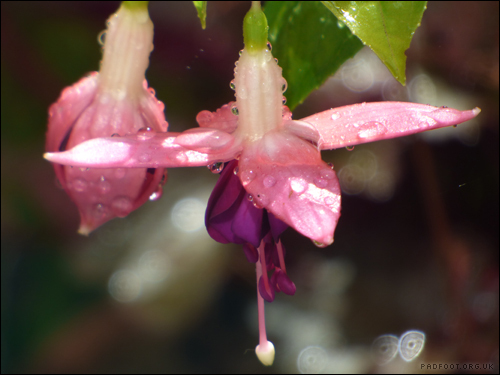 So when I looked into the garden after a rain shower, I spotted the raindrops on the fuchsia flowers. Nothing too spectacular about that, but with the way the sunlight was passing through the fence, it led to some interesting patterns on the petals. This entry was posted in Dragon Goes Wild and tagged #StayWild, 365 days wild, Fuchsia on July 28, 2016 by Dragon. Post the food in here! 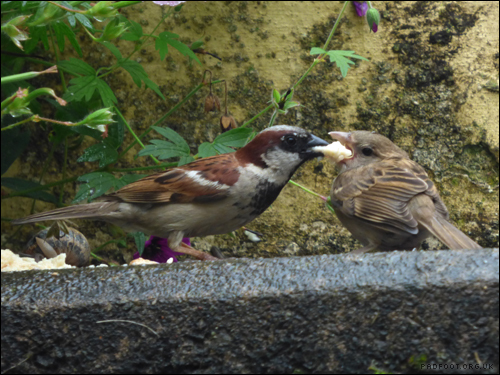 The House Sparrow families are back again! Bringing a few youngsters with them, they landed in the plants in the garden, swooping down to the wall where we’d left some food for them. 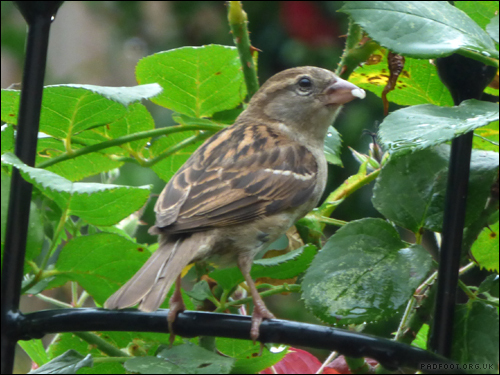 The young sparrows still haven’t got the hang of feeding themselves yet – they sit near the food with quivering wings and beaks wide open, ready for the adults to post some food in. I’m amazed the youngsters still managed to chirp so loudly, with their beaks full of food! 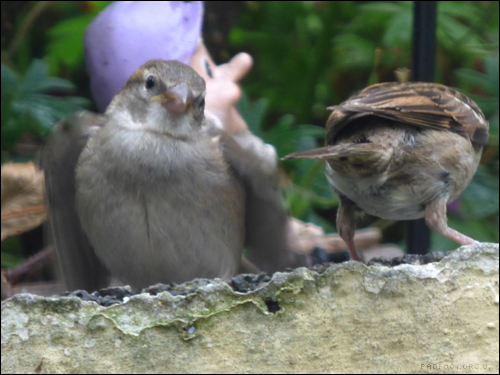 This entry was posted in Dragon Goes Wild and tagged #StayWild, 365 days wild, House Sparrow, Young Sparrows on July 27, 2016 by Dragon. Sitting in the ornamental Quince, he decided to sample one of the petals! I’m not sure if it was the moisture on the petal that attracted his attention, or if he really thought it would be tasty, but after dropping that petal on the ground, he didn’t try picking any others off. 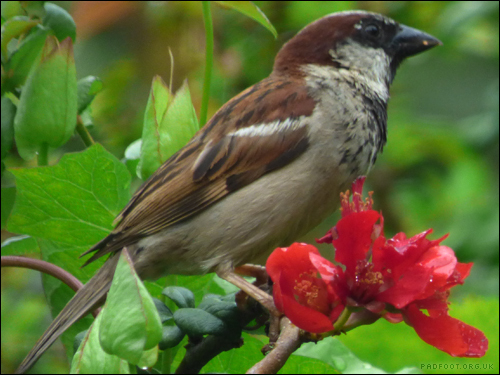 This entry was posted in Dragon Goes Wild and tagged #StayWild, 365 days wild, Sparrow on July 26, 2016 by Dragon. 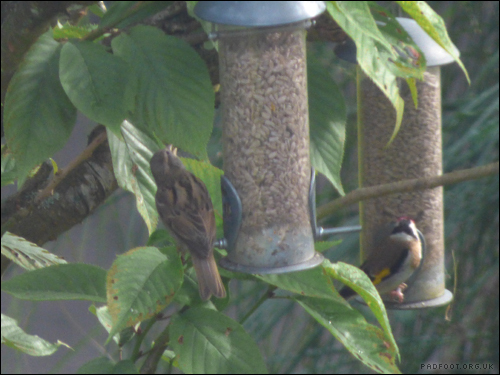 I know that seed feeders can be popular with small birds, but I never expected to see three different species all feeding at the same time! 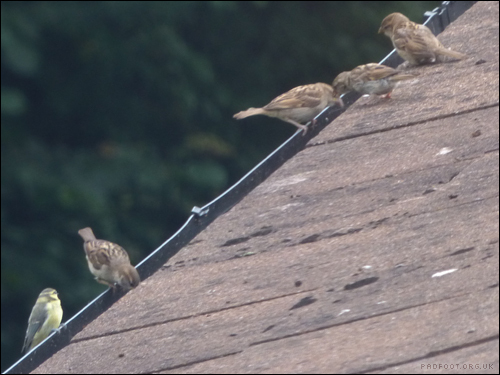 The birds which couldn’t get close to the feeders, all lined up on the roof. Either they’re drinking water from the guttering, or trying to pick insects and seeds from spiders webs. 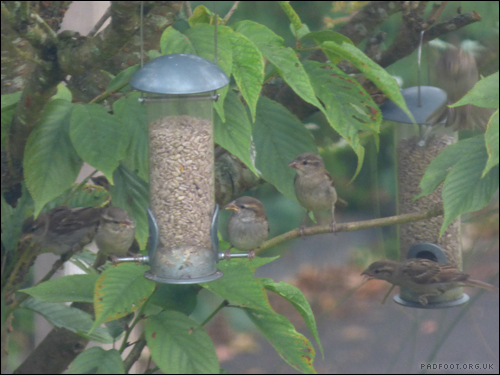 But the sparrows made the most sensible use of the tree – lining up on a nearby branch to take it in turns to grab some seed! 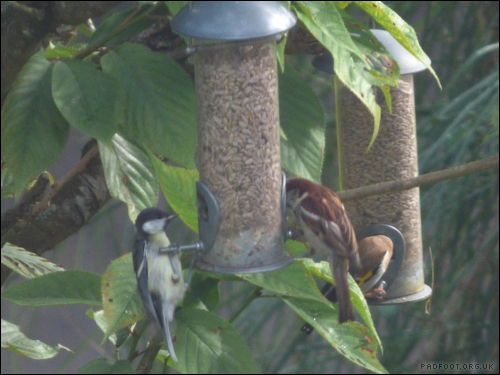 This entry was posted in Dragon Goes Wild and tagged #StayWild, 365 days wild, Bird Feeders on July 25, 2016 by Dragon. 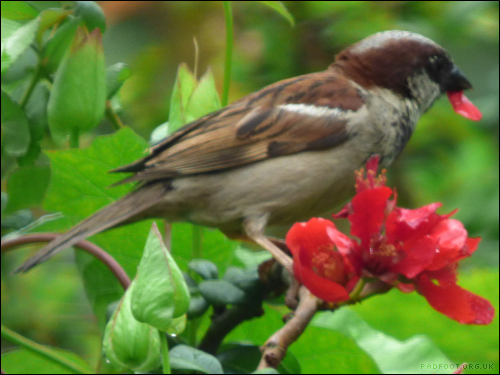 I could hear the short staccato shouting of a small bird in the garden. 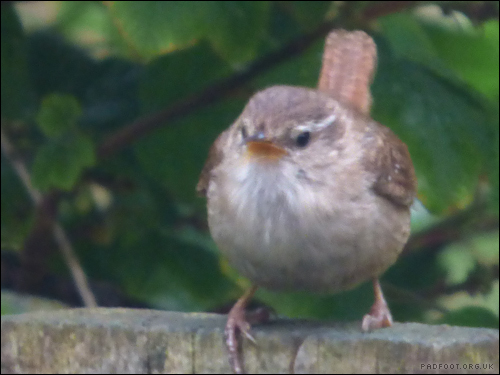 Thinking it was the female blackcap again I went to get my camera, only to discover it was actually a wren sitting on the garden fence. 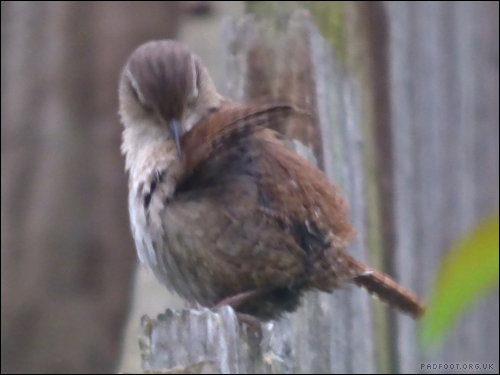 I’m impressed with the way the wren was able to preen its feathers and shout at the same time – that must take a lot of skill! 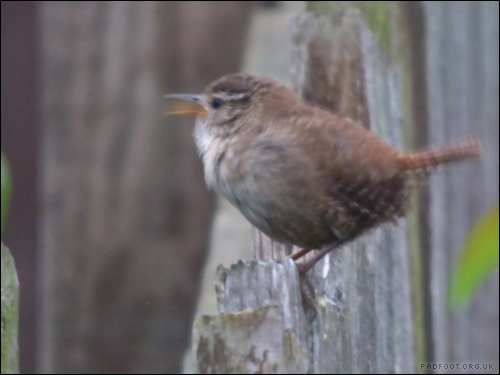 Suddenly the wren flew off, spooked by something on the other side of the fence. 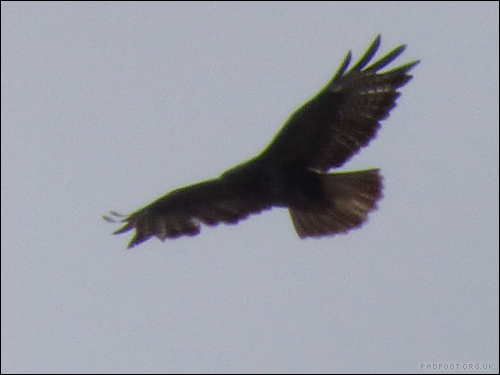 It didn’t go far though – it flew over to the opposite side of the garden, and continued shouting and preening for another few minutes before finally flying away. 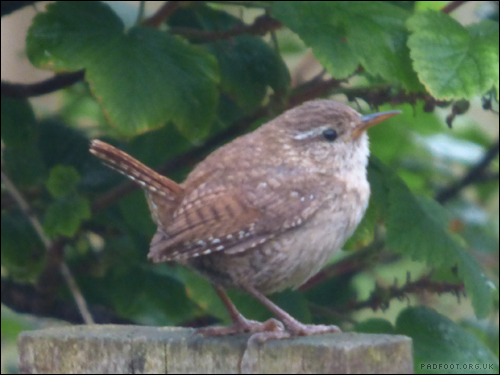 This entry was posted in Dragon Goes Wild and tagged #StayWild, 365 days wild, Wren on July 24, 2016 by Dragon. I bought a herb fennel plant in our first year as allotment holders – I hadn’t realised quite how readily it spreads its seeds! I now have multiple plants, but unless they’re in the way of other things I’m trying to grow, I let the new fennel plants grow too. Normally the fennel reaches about 5 feet tall, but this one seems to want to smash that completely. It’s already taller than me when I stand on the pathway – if I was to stand at ground level, I think it’d be getting on for a foot and a half taller than me! We don’t get many birds on the allotment site, so I don’t know if the seeds would be something birds would eat. 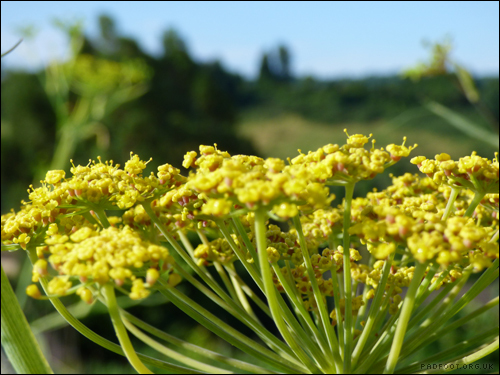 However the fennel flowers do tend to attract the insects; of course as I went to take the photo, they all flew off! 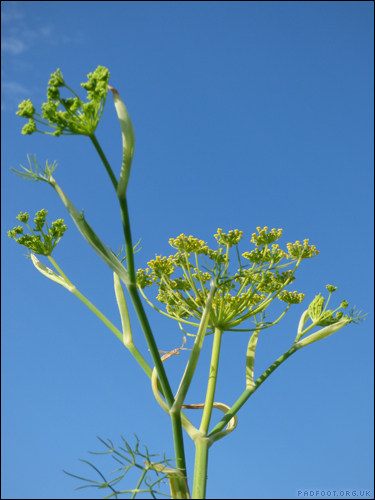 This entry was posted in Dragon Goes Wild and tagged #StayWild, 365 days wild, allotment, fennel on July 23, 2016 by Dragon. One thing you have to be careful of on the allotment, is where you put your feet. Not because the local cats might have left a deposit, but because the grasshoppers might end up underfoot! 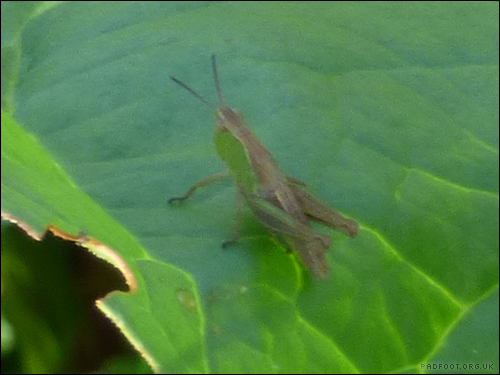 This one jumped onto the rhubarb leaves as I was walking past, and I spotted the next one on a small patch of weeds and grass that I was about to stand on. It certainly pays to walk slowly, so they get a chance to hop out of the way! 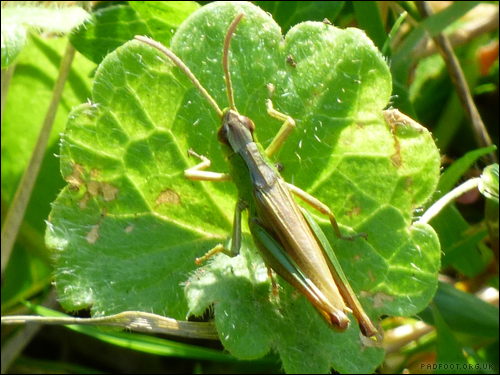 This entry was posted in Dragon Goes Wild and tagged #StayWild, 365 days wild, allotment, grasshopper on July 22, 2016 by Dragon.